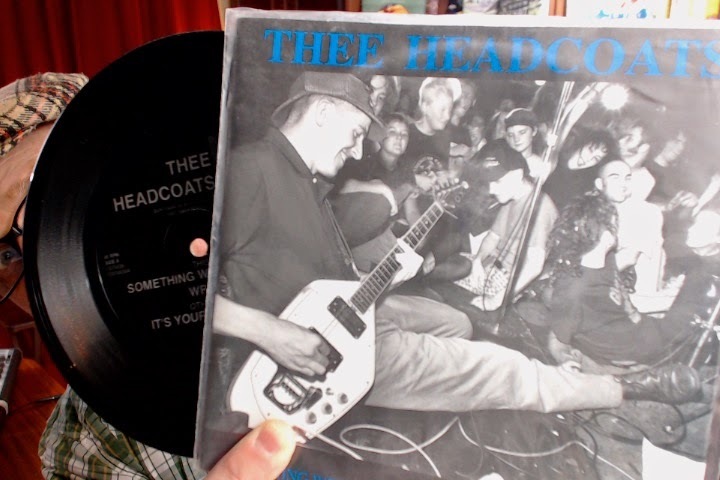 In 1991 Dionysus Records released a 7" single ID074535 - Thee Headcoats, "Something Went Wrong." It provides the backdrop for this post, so let's take a listen before jumping into the latest from Michael Kaiser's Haus. Last week I wrote that I was going to re-podcast all eppy-sodes of RadiOblivion by going all the way back to number one and embedding the new audio file links - which in turn would kick the feed and serve up every episode via iTunes or whatever service you use to subscribe to your podcasts. But as England's national poet... no, not Shakespeare - Billy Childish put it, "The car wouldn't start; just a little fart." So, too, the rocket known as RadiOblivion has a starting problem. RadiOblivion is hosted on Google's Blogger platform. It always has been. I've used the same mp3 player embedded in each eppy-sode post for a few years. Now I can't get it to work consistently. I don't know what the problem is - and I don't really care. I just want it to work. I can still get the episodes to podcast just by embedding the mp3 file in the posts, but it seems silly to do so if there isn't a working player there for regular, non-subscribing types to just listen and run. I don't want to mess with it, baby. So now I'm planning on packing my rekkids and going some place that the plumbing works. I've thought of Tumblr. Their audio player works great. I can use the same feed. But it's not really a blog, is it? Ixnay on UmblerTay. I've thought about a Wordpress.com site. But you can't use the same plugins that you can on a self-hosted Wordpress site. But it's free. I have self-hosted WP sites. The podcasting plugins are top-notch. But you have to pay for hosting. Maybe Wild Billy Childish is right. Could he be speaking to me from the title of the flipside of this little black launching pad? Could it be my fault - this predicament I'm in? Well, the bard could be correct if he means that my addiction to providing Better Living Through Discarded Music™constantly lands me in a quandary as how to deliver Wild Sounds and Rock 'N' Roll™ in the manner to which I'm accustomed. In that case, then yes, Mr. Childish, it is my fault. It's my fault, indeed. To be continued when I know what do. Any ideas out there? Let me know.